The CGSM observational program is built upon pre-existing world-class infrastructure. The locations and FOVs of CGSM instruments currently operating are shown on the two maps (above). Contours indicate constants of geomagnetic invariant latitude and longitude. The latitude contours shown are for 60° through 80° in 5° steps. Longitude contours are separated by one hour of MLT. For reference, geosynchronous orbit nominally maps to roughly 67° invariant (ie, Gillam), and the polar cap boundary is generally over, or poleward of, ~75° invariant (e.g., Rankin Inlet) in the evening sector. As well, local midnight on the "Churchill Line" is at about 0630 UT. Several CGSM program elements have obtained funding for significant enhancements of the instrument arrays. Specifically, Canada Foundation for Innovation funding has been obtained by the CARISMA, NORSTAR, and Canadian SuperDARN teams. With this funding, 15 fluxgate and 8 induction coil magnetometers will be added to the CARISMA (formerly CANOPUS) Magnetometer network. As well, the CFI funding will be used to add at least 5 ASIs to the NORSTAR (formerly CANOPUS) network, and one of the two planned PolarDARN HF radars. Plans are also underway to secure funding for a second PolarDARN radar, and an aditional three CADIs. The enhanced CGSM instrument array will provide higher temporal and spatial resolution synoptic data specifying the ionospheric electrodynamics over a larger geographical region than is currently available. This new instrumentation will allow scientists to address strategically important questions in near-Earth space plasma physics. 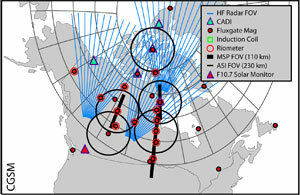 The instrument configuration in the expanded CGSM array takes full advantage of Canada's unique geographical advantage for ground-based geospace studies. Above, you can toggle between the maps of the current and planned CGSM instrument networks, as well as a cursory table of the instrument complement.. A detailed site and instrument list, as well as a list of contacts for the different instrument types, is included in the "site and instrument factsheet". A CGSM "Map Viewer" webpage is currently under development. On that page, the user can cycle through more than 8000 maps depicting CGSM instruments (current and planned) as well as those of other programs that are operating in the North American Sector.